Metallica’s Kirk Hammett, Charlie Benante of Anthrax, Pantera legend Phil Anselmo, Chino Moreno of Deftones and Chris Jericho are just some of the rockers featured in a unique video compiled from a series of clips on Instagram, with each jamming out to the latest preview of the Swedish band’s fourth record. Due June 1, Ghost recorded “Prequelle” with producer Tom Dalgety (Royal Blood, Opeth) at Artery Studios in Stockholm, Sweden. The set marks the group’s first record with new singer Cardinal Copia, who officially replaces outgoing singer Papa Emeritus III in the lineup following his work on the band’s third album, 2015's "Meliora", and 2016’s "Popestar" EP. 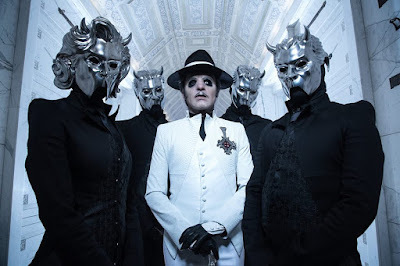 Introduced with the lead single, “Rats”, Ghost have been debuting tracks from the project ahead of its release on a recently-launched spring US tour that began with an intimate show at The Roxy Theatre in Los Angeles, CA on May 4.